Does turn to frog change my devotion? musicman3310 on Is It Safe? Here's some cards to think about Opt , Discovery / Dispersal , Vraska's Contempt (from side to main), Price of Fame , Moment of Craving , Nightveil Sprite , and a couple of spicy ones (This one for sideboard if it gets more artifacts) Phylactery Lich and Etrata, the Silencer . I personally don't like any of your enchantments but if they are doing good stuff for you then don't let silly ole me take your wins away. Happy hunting. Have you considered running more artifacts, Sai, Master Thopterist and The Antiquities War ? Alternatively, you could splash black and run Phylactery Lich in tandem with Treasure Map Flip. That would also give you some extra removal! Also- 23 lands should be plenty! I know that you have some bigger spells but your deck looks like it's mid-range/control enough to get anything you need plus you have the map for some filter. 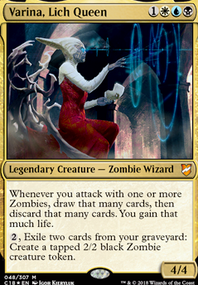 Lastly- I'd run one Oath of Teferi or add an extra Karn, Scion of Urza and 1-2 Teferi, Hero of Dominaria . In a deck like yours, the Oath is a win-more card meaning that when you get it, if you have the Planeswalkers down to make use of it, you're likely already going to win. As such, it's a neat one-of. But get above 8 planeswalkers, and 2 is a little more justified! But that's just my opinion! 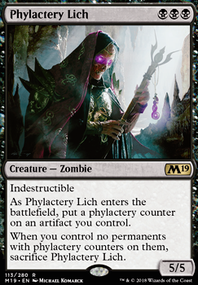 MagicMarc, Glaive of the Guildpact and Phylactery Lich work so well together. I'll be sad to see lich leave standard but for now he will continue to pulverize with this sword. How about Phylactery Lich ? You have those fountains in there. 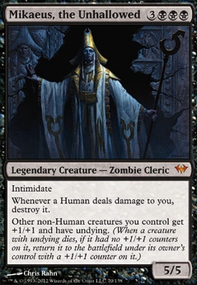 splashing black for Phylactery Lich could be fun. i've never seen the card Salvage Titan before so this deck interests me! I feel Phylactery Lich maybe too slow for what your trying to do and may want to focus on the super quick starts that are enabled by Salvage Titan. Firstly I would go to x4 Darksteel citadel's as this is an artifact you can play on turn 1 to enable a turn 1 Salvage Titan if paired with 2 other 0/1 cost artifacts. If budget isnt a concern you should pick up Mox Opal which can enable insane turn 1 plays. Welding Jar fits your deck theme and will mean you can protect your important artifacts on the board. Galvanic Blast is a good card if you have 3 artifacts or not, but your deck enable the metalcraft. basicallyrob was originally a finisher in V1 of this. Was only Dimir then and with the dual lands and Navigator's Compass it was a huge benefit in here. Let alone devastating on turn 3 to see out. Very consistent too being I had more artifacts and way to fetch artifacts in V1. Main basis was tezz and The Antiquities War with Zahid, Djinn of the Lamp and Phylactery Lich as my fat bodies. A dimir only version of this would still be very streamlined especially with Notion Rain and Discovery for surveil out there.